If you polled the Upskill team around the country, think you’d hear universally that the moment our team members really knew they had to join Upskill came down to when they put a pair of smart glasses on, and test drove our product, Skylight, for the first time. Quickly it becomes imminent that this technology will someday become ubiquitous. It’s that spark of imagination and curiosity that is so essential to learning and development, which is why our team believes STEM education is very important to child development. Earlier this Spring, a local Girl Scout service unit, a cluster of over 40 Girl Scout troops, hosted a STEM event geared towards girls ages 5-12 to showcase the many exciting faces of STEM. Local companies and tech clubs provided hands-on activities related to robotics, chemistry, engineering, rockets, biology, etc. Nothing screams STEM like AR and smart glasses, and Upskill was there representing. We sat down with Clara Dinh, senior software engineer, a five-year veteran to Upskill, mother of four, and Girl Scout troop leader to talk about the importance of this event and programs like it, and here’s what she had to say. Tell us about this event, and how it came about. Clara: Girl Scouts USA recently introduced an updated STEM program, including new badges such as ‘Programming Robots’ and journeys such as ‘Think Like an Engineer.’ The Service Unit thought it would be an eye-opening experience for the girls to see what STEM really means, how it applies to real life, and how each girl can be a part of it. STEM is a popular buzzword, but what does it really mean to these girls? Every day they are told the importance of math and science, but to be able to physically touch or perform an action, that’s what etches into their mind. They see that STEM can be fun and amazing and that they can have a great future in a STEM field. At our monthly leader meeting, the event organizers asked for help in recruiting local organizations to provide STEM-related activities or displays at the Girl Scout STEM Rocks event. Being in the technology-rich region that we are, we ended up with an amazing variety of organizations from high school robotics clubs to aerospace to nature conservationists. Over 100 girls experienced a myriad of demonstrations and creation, from robot wars to rocket building to hurricane-proof architecture. And, of course, Upskill’s Skylight experience blew their minds. You’re an engineer yourself. What led you to pursue the career you are in today? Clara: When I was growing up, STEM wasn’t a thing. Home computers were rare. The world wide web didn’t exist (difficult to imagine, right?). Luckily, my dad is a tech nerd. We had personal computers (Kaypro, MacIntosh, and some kind of laptop that was bigger and thicker than a standard briefcase) long before my friends even knew what a computer was. My dad also fixed a lot of things around the house, so I was always helping him take things apart and putting things together. I wasn’t passionate about any of it, but I enjoyed the video games, I enjoyed building things, I enjoyed sports. I was an average kid. Math and science were my easy classes, and I won a good number of local and state math, chemistry, and physic competitions. But it was not a passion. So when it was time to apply for college, I had no clue of what I wanted to do with my life. I ended up following my older siblings’ footsteps and applied to engineering schools. Computer engineering caught my eye, a mixture of electrical engineering and computer science. I could build computer programs, maybe even video games. Or I could create electronic systems. There were so many possibilities. Once programming classes started, I found myself excited to create graphical user interfaces and ended up following that path. It was a great decision as it has led me to a career where I’m still learning every single day, surrounded by the coolest new technology. Why do you think it’s important for our company to be involved in initiatives like this. Clara: Children watch and learn from their parents. Whether they admit it or not, most children emulate their parents and want to be like them. Many follow the same career paths because that’s what they grew up knowing. But what if they don’t know what’s out there and what’s possible? I was lucky in that my dad shared his passion for technology and problem-solving. My own kids know that I help build Skylight, which runs on really cool looking smart glasses. They’ve been to our office. They see me working from home. They always beg to wear the glasses and see what I’m working on. My ten-year-old daughter occasionally helps as quality assurance (QA) for our engineering team. She sits next to me with her laptop and calls herself “little Mommy,” and tells people that she wants to be a computer nerd when she grows up, just like mommy. My three year old has experienced Skylight and worn Google Glass. Not every child has a parent who can provide these experiences. Most schools can barely afford classroom supplies, let alone technology. So who better to steer the future and broaden the talent pool than the STEM-related companies and organizations themselves? Kids need first-hand exposure so they know what’s out there (besides the obvious video games, tablets, and smartphones). Girls, especially, need to be shown that it is cool to be smart and that they have a place in science and tech. Young minds are impressionable. 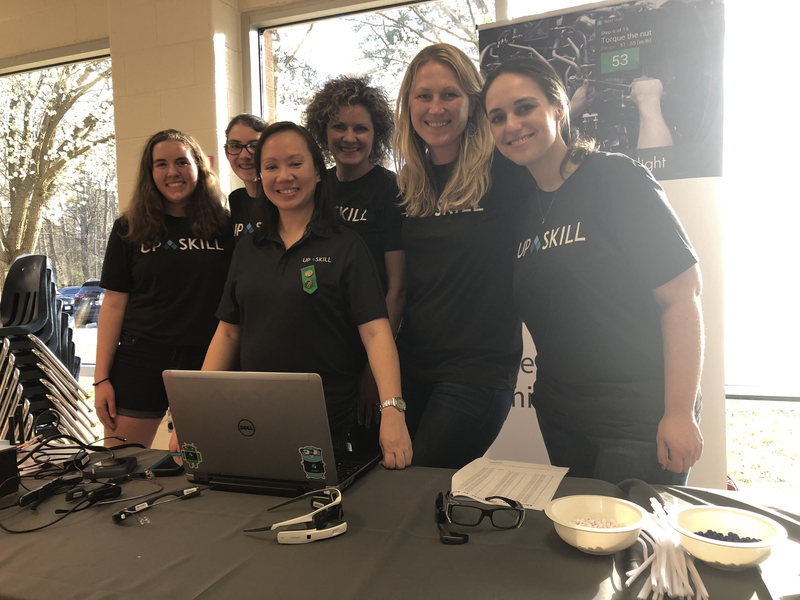 I’m proud of Upskill for taking the time to leave a great impression on these girls with our cool technology, and I’m thankful for the team of Upskill women who helped. I still get random comments from the girls about how cool the smart glasses were. Once they are exposed, once they have had a positive, something they’ve never seen before experience, they will remember, and they will want more of it. And companies like Upskill will be there to provide support along the way.